Although we know everything there is to know about the Samsung Galaxy S7 at this point, a crucial piece of information was still amiss – sales numbers! A month since the critically acclaimed flagship device launched, it seems the S7 is on a path to success! Korean market watchers report "stronger than expected" sales, noting that Samsung's mobile technology business appears to be recovering from its two-year decline. Reportedly, the company shipped nearly 10 million S7 phones (whether this includes the S7 edge isn't mentioned), surpassing the initial estimate for 7 million units and giving analysts ground to raise their sales forecasts for 2016. Last Wednesday, Samsung shares rose by 2.4% to an 18-week high, while Stock is up by more than a fifth since mid-January, following a 22% percent slide over the last three months. Initial perspectives for the S7's market performance were somewhat gloomy, as analysts had lowered their expectations amidst signs of a slowdown in demand for premium phones. Investors were also sceptic towards Samsung's projected belief that S7 models will outsell previous models on the basis of stronger than expected pre-orders. Samsung's January – March operating profit was expected to fall 16% from a year earlier to 5.2 trillion won ($4.51 billion), the lowest in six quarters. "From the investors' perspective, there's nothing wrong with making money without innovation." In addition to the good premium-tier sales, Samsung ramped up its efforts in the mid and low tiers to secure its market share. It also introduced the S7 and S7 edge a month earlier than last year's Galaxy S6, taking advantage of Apple not having new products out at the time. Analysts characterized both moves as solid market strategy on Samsung's part. Moreover, the incremental changes to the Galaxy S6's successful formula, which were expected to detract from customer attention, actually served to improve earnings, as the similarity between the smartphones helped reduce component and development costs. It also let Samsung ask a lower price for the S7, up to 8.3% cheaper in the critically important Korean market. "From the investors' perspective, there's nothing wrong with making money without innovation," said Lee Jin-woo at KTB Asset Management. Samsung said its earnings were not yet finalised, and it declined comment on sales or shipments for the new handsets. Mar 08, 2016, 8:00 AM, by John V.
Mar 25, 2016, 4:08 PM, by Ray S.
A phone worthy of great sales. Now come out with the foldable display phone already, Samsung! I really can't wait for that from samsung. I'll be the first in line to buy it regardless of how much it cost! He said: "Regardless of how much it costs"
am saving bucks while waiting for the Note 6 :D this is certainly a great time to be a Samsung user.. congrats Sammy! And they better not mess with note 6..like they did on 5, note 4,still the best note imo.. Looking at the picture of S7 edge. It's truly a thing of beauty. 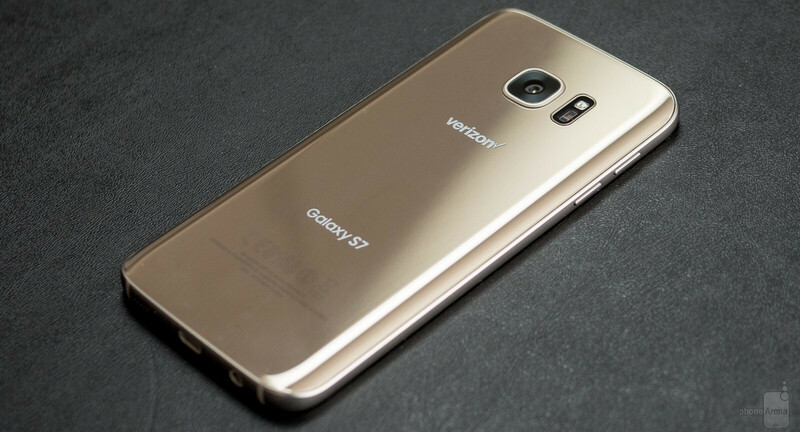 When I first saw the S6 Edge in gold last year, I thought it was unquestionably the most beautiful phone I had ever seen. Got one for my wife, and then the S7 Edge for myself this year. I recommend going to see one in person, but with this caveat: "Warning: seeing this phone in person may have implications for your wallet." It is obvious they shipped more than that because they said they shipped 10M in China alone. This number obviously isn't counting North America pre-order sales. Both Verizon and ATT who are the largest sellers of Samsung device easily could have had more than 5M pre-order at the least per carrier. Then add T-Mobile and Sprint. 20M+ or more pre-orders is not far-fetched. I don't knwo if Samsung can make 40M phones in a single quarter, that doesn't mean they didn't receive 40M orders for them or more. I said they could have had 40-50M sold in just 3 weeks. This is counting world orders, I never said they were goign to ship that many in 3 weeks. Learn how to read. You simply link an article for one country. Do the math. lets just take this number and pick 3 major countries where Samsung will sell this device. If they already have 10M in China, then that means both Europe and the USA will each have at least 10M+ each. That is more than 30M phones on pre-order. Whether Samsung could fill such an order would depend on how many phones that were able to produce between the last quarter of last year and 1st quarter of 2015. Here is what we do know. Based on a PA article, it was said that Samsung can produce a certain number of displays per month from one single factory. Assumign Samsung could crank out at least 2M phones per month, that means depending on when they started, they easily could have at a minimum 12M phones already to go. If they have already shipped/sold 10M to just china, and we know as a fact the USA/Canada and Europe sales would be at leats 10M+ for each continent, that means an easy total of 30M+ phones. I know you're only here to troll me without mentioning my name, but I stand behind what i said. look at the numbers. The S6 and S6 Edge models had over 9M pre-orders last year for the USA alone. I don't know why Samsung doesn't mention pre-order for all major continental sales. DO THE MATH! 10M+ in China 10M+ NA 10+ Europe and that 30M+ phones with close to 40M in a single quarter and this is just one model. This isn't counting all selling Galaxy S models. Which means the S5, S6, S6 Edge, S6 Active and S6 Edge+ are all still selling especially now with the price drops. Count the sales of all sellign models for a single quarter and Samsung could still sell at least 50M total phones just from the S line. Then add the Note 5 which is still selling and Samsung could still sell over 100M+ from the two phones models just like they have been doing since 2011. I'm doing the potential math. I am basing my numbers from facts, not fiction. I am basing my numbers off the fact Samsung has been selling 80M phones per quarter since 2011 on average. With 300M+ being sold every year since 2011. We know that the S and Note have consistently combined to sell roughly 100M phones. Also what this shows me is, the Galaxy S as a single model each year, does outsell one single iPhone model. But we just dont know which one since Apple doesn't report model sales, they just report iPhone sales. Apple sold 50M iPhones last quarter. How many sellign models to thay have? Let's see, the 4S, 5S was still selling last quarter, 5C, both 6's and both 6S models. So Apple has 5 selling models and they sold 50M last quarter. That means at least 2 of those selling models sold less than 10M. Make sure you notice I said, LAST QUARTER so you dont try to mince my words. I am not including the 5SE because it only just came on sale this quarter officially. But we dont know that based on the 5SE release, Apple pre-order sold 3.5M. So from that we know that the shipped to China orders..
...beat the sales of at leats all iPhone selling models except the iPhoen 6/6S models. And let me show you more. The article in your link says, China has 10M+ alone. Then the very next paragraph says this and I quote-copy/paste: "Coupling this with info about European preorders that have allegedly been two and a half times higher than what we experienced with the Galaxy S6 and S6 edge, and Samsung may very well be back in the mobile profit game when all is done and dusted, and everyone who wants an S7 or S7 edge has gotten one." Europe pre-order were 2.5 times that fo the S6 models. In the USA alone the S6 models has 9M pre-order. I don't remember how many Europe had. But based on this link,http://www.androidauthority.com/samsung-pre-orders-galaxy-s6-edge-593224/ - the S6 had 20M pre-orders. If Europe alone based on YOUR line had 2.5 times the pre-order sales, then add the USA which will easily be 10M+ and we know China already has received 10M+, that is easily 40M sold in just the first month. Maybe you should actually read what you posted while you were trying to troll me. I stand behind everything I saw 100% because I know I can give facts to backup what I say. I'm not a fanboy of any one OEM. I follow all tech and am platform and OEM agnostic. As another poster said, Samsung is goign to have its most sales in the first quarter as does Apple and every OEM. As more quarter roll by, those sales drop as we get closer to a newer model. That means based on the number we do have, the S7 will sell at least 40-50M in 6 months. That means as a SINGLE MODEL, it will have outsold any single model of the iPhone last quarter. after all Apple only sold 50M+ last quarter. Even if Smausng sells only 20M S7 for this quarter as a minimum, they will still have outsold every single selling iPhone model as a single model. That means the S7 outsold the 5S as a single model. It outsold the iPhone 6 as a single model. It outsold the iPhone 6S as a single model. It outsold whatever other models they are still selling as a single model. This has been true since 2011 that the S alone for at least 3 quarters of a year, does outsell a single model of the iPhone is you pick a specific model and not lump the sales of all selling models as one like Apple does. Because if Apple reported the sales of each, the S would be beating all single selling iPhone versions. That was a great read! * *only joking, didn't read it. So what! Why waste your time saying so? I know, because you don't have an argument because like the other guy, you're a troll too. OMG dude the wall of text....and yes YOU DO THE MATH. No one releases sales numbers, it is all SHIPPED. So all those stores that have 10 phones in the back ready to give out, don't count. To Samsung they do, because to them it is 'sold' but in actual hands they don't. Lets go by last years 2015 Q1 numbers ( IDC shows ~290million phones shipped in Q1). Considering that is all smartphones, we have to now chunk out 82%. So 237M are Androids. Now Samsung has a 27% share of that pie. 64Million. Now we all know Samsung does not have a 64million pie of high end phones. No, 80% of all androids are low ends, this also holds true for Samsung. So that means in the entire 3 months Samsung sold 12.8M HIGH END PHONES. Read that again, high end phones are approximated at 13M at best, this includes the Note series etc. This is for an entire quarter. Hell lets give you the benefit of the doubt and say 30% of samsungs are highend sales, that is only 20M So unless you are willing to go on record and say that Samsung for then entire month it has been on sale, Samsung has destroyed all their past records for sales...no. By the way Q1 is Jan Feb and March. Considering it was on sale for half of march, you are trying to say, that in two weeks, with ONE phone (if you are truly claiming the s7 Edge is not computed into those stats) That they blew Q1 of 2015 high end phone sales. That Samsung relies on a 2week launch to make over half the phone sales for their ENTIRE quarter output of all their devices. Yea no. They may have produced and shipped....but there is no way in hell you are going to convince anyone here that half of Samsungs Q1 sales are reliant on a new product launch in a 2 week window....no. Your point is well taken. But here is what you aren't counting. If I make a sale of a product in the first quarter, even if I dont have the stock available because they are in production, I can out all those sales as sales for that quarter even if the order hasn't shipped. Assuming in fairness, I have a guaranteed order to fill where I am going to get payment. You appear to be trying to count phones that have actually sold. I am counting what is a poential 1st quarter pre-order counter. I am not claiming Samsung has or will ship 30-40M phones in the first quarter. What I am claiming is thay likely got at least or very close too 30M pre-orders already. Again I am only basing the number from the article. If Samsung has shipped 10M phones already to China, how many pre-orders are we to assume the USA likely has? How about Europe? Remember, CARRIERS ATE CUSTOMERS just like we are. Carriers must purchase the device before they can resell it to you. I only said, since Samsung is selling 300M phones per year, and 1/3 are the S and Note. Yes based on yoru numbers, sure the S could be selling 12M per quarter, but factually we know its higher than that. Go look att eh sales of the S3, S4 and S5, Both the S4 and S5 both reached 40M sells in 6 months or less. That means when all these order are finally filled in the first 2 quarters its avail, those will be the vast majority of the sales. Is that a fair assumption? The S6 received just 20M on pre-orders alone. I assume those are worldwide numbers. In 6 months those numbers would be at leats 50% of that. Again as I stated, I don't know how many phones can be produced in one quarter. I can only guess that if Samsung has already shipped 10M to China, that can make at least this many in one quarter. Assuming the phone goes into production one quarter prior to its release. Also the S7 was release a full month earlier, which means it sales will count for the first quarter for all the ones that shipped. But let's both wait for some hard numbers and see. if Samsung sells 40M+ phone sin 6 months like they did with the S3/S4/S5 and I assume the S6 sold close to that in 6 months after 20M pre-orders, I dont see why you think the S7 is sellign slower when it was already reported the S7 in Europe ws selling at an opening pace of 2.5 times of the S6. How many phones in the first 2 quarters did Europe get?I would guess that total is 10-15M. If the S7 is selling at 2.5 times the pace, we are looking at 20M just for Europe, 10M for China and then that least at least 10M for the USA. Whether Samsung can ship all those in a single quarter is not relevant to what I said. I simply said they were already sold and the orders simply have to be filled. 10 million isn't good at all. Even the s5 sold as much or more initially. I don't think this phone will ever be able to touch the 50 million milestones set by s4 and s3. I'm predicting around 30 million total sales since most of the sales are done in first month. If true, the S7 shipped 9.5 million in 20 days, while the S5 shipped 10 million in 27 days, the S4 in 25 days respectively. I'd say the S7 numbers are actually slightly better over the same period. In a much more mature, more competitive (Chinese with cheaper offerings) and heavily saturated market, that would actually be mighty good. You must note that S7 was released before march started in most countries. No, most companies/countries started at march 11th. Some USA providers like T-Mobile started shipping earlier. The latter accounts for a very small part of the worldwide market. And if you remember correctly, the same happened with earlier models too, for example AT&T delivering S4 phones early in the US too. Considering the current state of the market it's a good result. They may never see the sales figures for the S4 repeated. Considering the saturation of the smartphone market, I think 10 million is a pretty decent start. At the time of the Galaxy S4 and even the S5, there were significantly fewer competitors for Samsung's marketshare. Now that Chinese manufacturers and others have leaped into the fray, it seems that it would be difficult - or almost impossible - to match the sales of yesteryears. S4 holds the record for the Best Sales followed by S3. It took 3 MONTHS for S5 to reach 12M Sales. You claim is invalid mate. http://news.softpedia.com/news/Samsung-Sells-Only-12M-Galaxy-S5-Units-in-the-First-3-Months-40-Less-Than-Expected-465720.shtml So this link says that S5 sold 40% than the GS4. Which adds up to 16.8 M Sales for the S4. This is for 3 Months. Considering that this is the first Month. 10M is impressive. They are going to be the Best Selling phones for Sammy.